I love the KA-BAR Fighting Survival Knife! For me this is the standard by which I measure, compare and judge all other knifes. The KA-BAR Fighting Survival Knife has proven itself in survival situations, combat situations, work and utility situations. It’s a great knife, an incredible knife. There are knives out there that are specially designed for a specific task/use and niche and will outperform the KA-BAR Fighting Survival Knife for that narrow usage. The KA-BAR Fighting Survival Knife (Check prices here) is does everything well but is not the master of anything. I try to avoid any knife that is not equal or on-par with the KA-BAR Fighting Survival Knife because I considered the KA-BAR Fighting Survival Knife the standard. AMERICAN MADE by an AMERICAN Knife company (Cutco Knives Corporation) in upstate New York. I just love KA-BAR Fighting Survival Knife. I think it’s a great survival knife especially in this price point, it’s a proven knife. It’s hard to beat the KA-BAR Fighting Survival Knife at this price point, it is an exceptional value for a survival knife. I want to say that the KA-BAR Fighting Survival Knife is a great knife and its point break and for its intended use. However, as a Prepper or a Survivalist, there may be knives that are just as good or possibly even better. Now, as a personal judgment as to your specific use of the knife, for example, there’s a Becker BK2 and I believe KA-BAR Fighting Survival Knife now currently makes it. They took over the design and manufacturing. But this Becker BK2 is like a tank. So maybe for some, if you want to pry things and really abuse your knife, this maybe a better choice than a KA-BAR Fighting Survival Knife. Now, just for a fighting knife, if you are just going to fight with the knife, I would choose the KA-BAR Fighting Survival Knife. The Ka-Bar is more streamlined, easier to wheel, has a little bit longer blade for penetration. So see, you got to understand the purpose. What’s the use of knife? What’s the intended purpose and use? Now, I did compare it to another knife, the Cold Steel Recon Scout. Some people are calling it a Trail Master. It’s similar to the Ka-Bar, so there’s a full whole grind and it’s a little longer, a little different than a KA-BAR Fighting Survival Knife. That’s why I like this Cold Steel because it is thick. It has about the same durability, somewhere durability of the Becker BK2 and it doesn’t mean that – the Ka-Bar is also very durable knife. It’s proven. But this is a little thicker and it’s a little longer so it’s a combination of durability and fighting ability. And that’s why I choose the cold steel knife because preppers and survivalists have different needs. Now, none of these knives maybe as good as some bushcrafting knife if you’re just going to be a survivalist and do skinning and a little – and things of that nature. If you’re not going to use it for combat and you’re just in a survival thing, but there may be better choices. I’m not saying these are the best of the best. But these are quality, quality knives. Now, here is another knife that is really a good quality. It is a Randall Design Ontario. This is not the RAT. And this particular knife is a great knife. This is for a specific purpose because I wanted a small, every day carry knife that I could stick easily into my expedition or bug out bag because it was easier to carry on a day basis. It’s durable, and it’s smaller, shorter than any of these knives, it’s even a shorter blade than the Becker BK2 and perhaps not as durable. Or it’s not quite as thick but this is a D2 steel. Now, if I was going to bug out in my bug out bag, I would prefer this knife. And I didn’t have this, the Becker BK2 would work, the KA-BAR Fighting Survival Knife would work. All these knives are great, phenomenal knives and they fit the needs of a prepper. And I’m talking about for prepping because here is a scenario, as a prepper, you are not in a survival situation that may last until you’re rescued. You’re in a survival situation that may last the rest of your life. You may be driven off your retreat. You may be bugging out. You may – if you have an inferior knife and it breaks, what are you going to do? You can’t go online and order a knife because you’re bugging out. So that’s why I pick knives that I think are durable and have functionality. Maybe the KA-Bar is not for you, I’d recommend you consider a Kukri Knife and checkout reviews of this knife. Now, as a bushcrafter, you may say, “These are too big or too bulky or too heavy,” or whatever. But I’m looking for durability. I’m looking for fighting, self-defensibly, and so I want a knife that’s not going to break. And I believe all these knives have the characteristics of durability. The KA-BAR Fighting Survival Knife is a little thinner but it’s a good, good steel and it’s proven and it will function. I don’t care what knife you have, any and every knife can fail if you misuse it or if you don’t use it right. Even if they just don’t have – they’re tools. And any tool no matter what the quality can break. So it’s up to you to really utilize that way it was intended to use. They’re all great durable knives. And man, I love the KA-BAR Fighting Survival Knife. And I have several of every knife. I’ve been using this and I have used this knife for years. I can’t remember how many I have. This is probably one of the most easily recognized and most famous knives in the world. Even non-knife people would probably recognize this knife or they would certainly recognize the name. It is of course the KA-BAR fighting utility survival knife. This knife really is what made KA-BAR Fighting Survival Knife name. It’s what made KA-BAR’s reputation and for many people, this knife is in fact the KA-BAR Knife company. I prefer the foliage green version. Which is a modern update on what is an absolute classic knife. I bought this particular version because I felt it would be useful and suitable for me if I did decide to carry it out in the bush. So we will just have a quick talk about what this particular knife has different to the original. The original of course had the stacked leather washer handle. This has a modern material in it which is called Kraton G and again this is foliage green. So they’re very nicely finished up. It has got grooves and it has got a slight texture into it and just a little bit of softness to it and very, very grippy handle, very nice feeling handle in hand. But basically the design is by and large as it used to be. It has got a false edge up on the top. It’s flat ground and of course you can see it has got these blade grooves in it. Stamp is on the side, made in the USA. On the other side you can see, “KA-BAR, Olean, New York”. So this is an absolutely classic American knife. Any serious knife collector has probably already got KA-BAR Fighting Survival Knife. If you don’t, go ahead and get yourself one. The steel on the KA-BAR Fighting Survival Knife is 1095 Cro-Van. So it makes it again a good wilderness type steel. Good tool steel that will hold up to a bit of abuse and on YouTube, you would see plenty of guys who have successfully used this knife in the outdoors splitting logs and pretty much any other task you can think of. You could use it for hunting, camping, hiking, obviously military use. I believe there are still people who carry this every day. 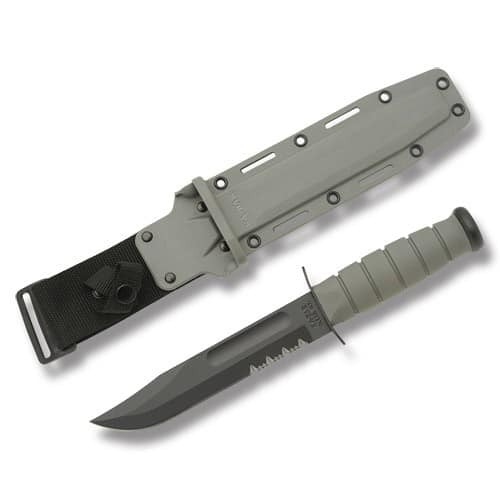 This is their KA-BAR Fighting Survival Knife and probably also a service or survival knife quite adequately. There are better options of course but this would certainly do the job for you. Particularly the sheath that comes with this version and again it’s color-matched. I should mention there are other colors available, black handle, black sheath. There’s also a desert version which is kind of a sand color obviously to suit the current feat of military operations and the sheath is excellent, really excellent. It’s made up of fiberglass-reinforced nylon. They are riveted and molded. The KA-BAR Fighting Survival Knife will fit an ambidextrous, going right or for you left handers like me, left-handed, it goes in lefty style. The sheath has four rivets, nice and solid and grooved. You could use some para cord for those grooves if you wanted to secure it to your leg or pack. And little drain hole down at the bottom to let water out of the sheath. What I’m really impressed, if you have a look at the profile that the sheath has narrowed, that is really brilliant. This rides incredibly well on your side. It’s just a perfect sheath for this knife actually. So the KA-BAR Fighting Survival Knife and sheath combined, 14.7 ounces or 420 grams which considering you’re talking about a full seven-inch knife. I think that’s more than reasonable. Balance on the knife is really good. Now the balance point is just around guard so it’s basically a perfect balance and you can imagine. Not that I’m any sort of knife fighter but it’s going to be a very quick knife in that sort of application. The quality of the knife, actually I’ve got to say I was very surprised at just how good quality this is. The blade finish is a very fine black finish, very even. Joined down the bottom towards the guard, it’s all really nicely finished off. Interestingly enough this is, as I said, a modern update of a classic but I do like the fact that it still holds skill in its manufacturing. You can see just through the back of the pommel, that’s where your tang comes through and that’s actually attached with a pin. This pin runs through and attaches to the handle and that’s right from day one back in World War II. So I really like that. This is a combination of great old skill way of building something and craftsmanship and some modern materials. So a perfect knife for me. I think the foliage green just looks sensational and it certainly suits any environment. So in conclusion, this KA-BAR Fighting Survival Knife is very high quality. The value on these is absolutely outstanding, incredible the price you can pick these things up for and an outstanding value for what you’re getting. Really great collectible. KA-BAR Fighting Survival Knife is a must-have for any serious knife collector to have at least one of these things. There’s, as I mentioned, various versions. Maybe you want to get yourself one of these and actually use it for work. You might buy a commemorative version to have in your collection and have on display.